Vladimir Chizhov, Russian ambassador to the EU, has been interviewed by Fariba Mavaddat for euronews, and uses the opportunity to hit out at Brussels for "systemic blunders" over its handling of the crisis in Ukraine. 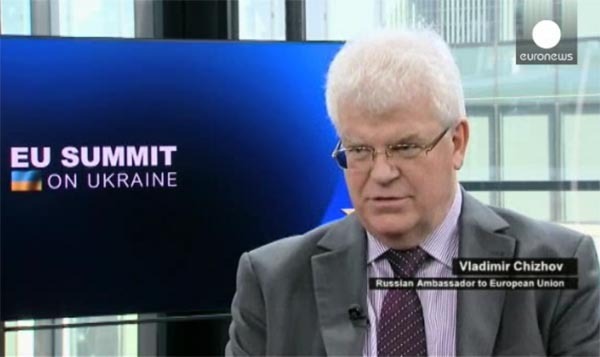 I believe, Chizhov says, that the European Union has made a series of systemic blunders as far as Ukraine is concerned. First it tried to pull Ukraine into an association without actually taking into consideration the complex nature of Ukrainian society. The Ukrainian society, for different reasons, including historic, linguistic, even confessional, has never been a homogeneous society". "But what was wrong with a harmless agreement? ", Mavaddat asks, getting a response from Chizhov that: "It was actually not so harmless". The Association Agreement, he said, "would have entailed Ukraine adopting a number of wide range of elements (the acquis communautaire) of the European Union into its own national legislation". Further he said: "Introducing norms, regulations, policies and so on, that would have created a certain difficulty, I would say, to put it mildly, in the economic relations between Ukraine and Russia and, of course, other members of the customs union – an immediate neighbour of Ukraine, Belarus, and Kazakhstan too". Spelling it out, Chizov then says, "So, those would have been the implications. Our economies were part of a single economy for decades and still they are closely-linked. An association with the EU would have gone far beyond just free trade. Free trade is okay, but it would have brought Ukraine well into … the circle of inference [sic] of the European Union". The interesting thing about this is that it is no more or less than we have been saying all along. This may or may not be the truth – the ambassador almost certainly has his own (or his country's) agenda. But, in confirming our analysis, it tells us that the effect of the Association Agreement and the EU "provocation" is far more important than most commentators have allowed. In fact, it would be not untoward to suggest that most of the pundits have got it wrong. The thing is though, it should not have been that hard to work out. Poking the Bear with a stick and there's going to be a reaction. Simples really. Now, with the EU huffing and puffing about sanctions, even the Guardian admits that the effect on Putin is likely to be negligible. And that was very predictable as well. But the propensity of the politicians, if not the media, to get it wrong seems to be infinite.